Rep. Peterson arrived around noon. Local officials hope he may be able to help get the town a disaster declaration which would clear the way for funding from the government. But Peterson says he doubts the damage will meet federal requirements for a disaster declaration. "Even though it's a big disaster here for the town, it's a big part of the town that was flooded, when you translate it into the regulations we have at the federal level it doesn't fit what we have set up," he said. Peterson says the federal government might pay to build a diversion channel for the Little Minnesota River around town. A plan for that effort was put in place in the 1980s but was abandoned when land owners in South Dakota didn't agree to the measure. 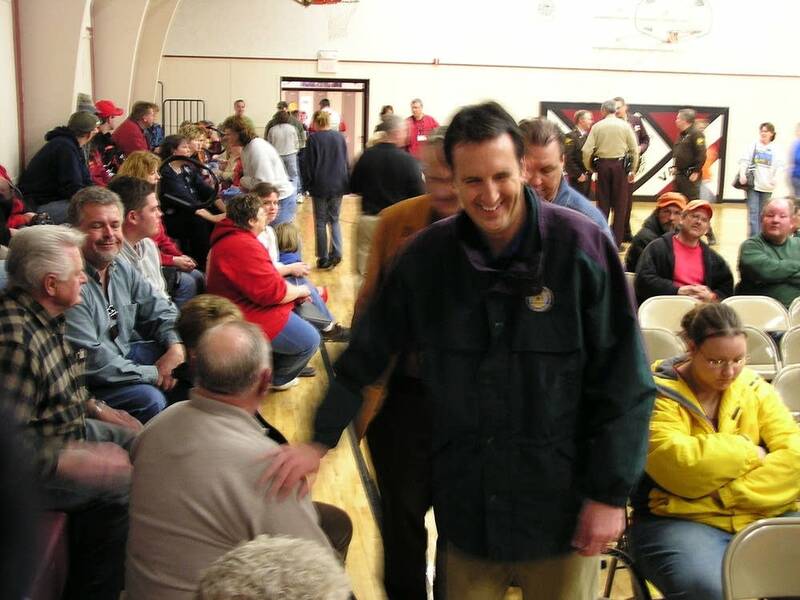 Pawlenty arrived in mid-afternoon to see the flood damage. After the tour, Pawlenty told a crowd of 150 residents he agreed with Peterson's assessment that qualifying for a federal disaster declaration is unlikely. "Maybe we will," he said. "But if I had to take a guess right now I'd say no, so this is going to fall on the state." Pawlenty said the state would do what it could to offer financial assistance to the town as it recovers. "We got a real crisis here and we want to make sure that we do what we can to help you and help the community and we will," he said. "We look to the mayor and local officials to tell us what they need, and we stand ready with these types of resources to respond and to help." Pawlenty says the state may be able to offer local residents low interest loans to fix up their flooded homes. But but because of the large number of elderly residents in the small town, Pawlenty says the state may need to offer some residents emergency housing or grants to repair their homes.